We focused on the genes that may be involved in the interaction between bacteria and ourselves. To identify these genes we developed procedures allowing to monitor the response of human cell lines when brought in contact with the genes present in gut bacteria. A two-pronged approach was followed. On the one hand, we constructed a large collection of genes from intestinal bacteria in a standard E. coli cloning host. 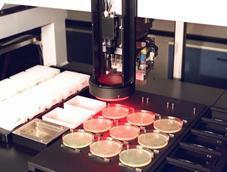 The collection comprises over 200 000 clones, and a total of over 8 million genes from intestinal bacteria. On the other, we established 16 different screens, based on the human cell lines carrying various reporter genes. We validated our approach in a pilot study with 5000 bacterial clones, where a high-throughput robot was used to carry out 25 000 individual tests. About a dozen clones were found to induce a significant cellular response. We further tested, in culture, the effect of 5 clones on the dendritic cells (DC), either directly or indirectly via intestinal epithelial cells (IEC). DCs are thought to be among central elements of the immune system response. The metagenomic clones differently regulated gene expression in IECs, and their impact on IECs clearly conditioned DCs response. In addition, one clone directly affected the DCs. Analysis of these clones may lead to a novel understanding of interactions between the bacteria that we host in our gut and us.